San Francisco, CA, October 1, 2018 – Bindlestiff Studio’s Chasing Papeles brings to light the largely hidden and unspoken experiences of undocumented Filipina immigrants. Through spoken word, music, movement, and shadow puppetry, Chasing Papeles vividly reflects on the hopes, dreams and disillusions of chasing the American Dream. Primarily set in a senior care home in the San Francisco SOMA district, Chasing Papeles presents the highly relevant experiences of undocumented immigrants in the heart of the SOMA Pilipinas Cultural Heritage District. Chasing Papeles opens on November 2, 2018 (FREE Community Preview Night, November 1) and runs through November 17, 2018; performances Thursday-Saturday, 8pm; Saturday matinee at 3pm on November 17. Written and directed by Andrea Almario as her thesis play at the UC Berkeley Department of Theater, Dance and Performance Studies, Chasing Papeles touches upon topics still incredibly pertinent to today’s American society and culture. Even more locally, recent cases of human trafficking, exploitation, and sexual assault of undocumented workers in the Bay Area offer a revealing glimpse into the underlying injustices and dangers that threaten undocumented immigrants in the most unexpected corners. Staging the play is even more of an intimate and family affair for Andrea Almario, coming from a family with a history in theatre arts and then developing the narrative with the help of her mother Rose Almario and sister Aureen Almario (Chasing Papeles co-director and Artistic Director of Bindlestiff Studio). Andrea started her interest in theater by taking her first acting class at Chabot College. She joined Bindlestiff Studio and attended various workshops for writing, acting, standup comedy and directing. She performed for multiple productions including Stories High and Movement through Bindlestiff. She performed at SF Sketch Fest for two seasons with Taste Better Wit sketch troupe. She is a writer and performer for Granny Cart Gangsters, an all-female sketch comedy group that produces both theater and video sketches. Andrea was a lead in the short film Grace which was featured in Cannes Film Festival. She acted and danced for Aimee Suzara’s History of the Body. 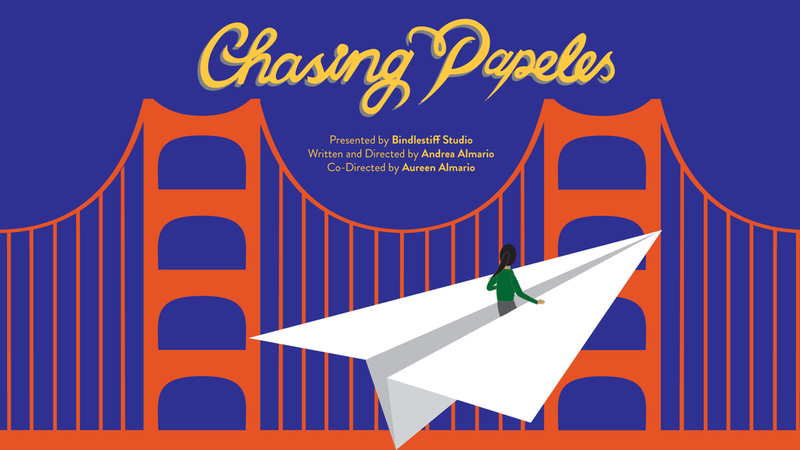 Andrea wrote and directed Chasing Papeles in 2016 and is now adapting it for her home stage, Bindlestiff Studio. Andrea graduated with honors from UC Berkeley’s Theater and Performance Studies program and is a recipient of The Eisner Award 2016 for Outstanding Playwright and Directing. Her writing and performance is strongly influenced by her experience of growing up undocumented in the Bay Area and being Filipino. The cast of Chasing Papeles include: Lynie Abadilla, Rose Almario, Akiko Aspillaga, Giancarlo Cariola, Amianan Daus-Magbual, Lauren Garcia, Edu Ibazeta, Felicia Jacobe, Johnny Nguyen, Sunshine Roque, Patrick Silvestre. Sponsored in part by the SF Arts Commission, Grants for the Arts, Mayor’s Office of Housing and Community Development, the Fleishhacker Foundation, and the Zellerbach Family Foundation. Originally opened in 1989, Bindlestiff Studio became the only metropolitan, community-based performing arts venue in the nation dedicated to showcasing Filipino American and Pilipino artists. Bindlestiff Studio provides the often under-served Filipino American community access to diverse offerings in theatrical productions, music and film festivals, workshops in directing, production, acting, stand-up comedy, and writing, as well as a children and youth theater programs. Bindlestiff Studio is one of the proud anchor institutions of the SOMA Pilipinas Cultural District. Cast: Lynie Abadilla, Rose Almario, Akiko Aspillaga, Giancarlo Cariola, Amianan Daus-Magbual, Lauren Garcia, Soluna Ibarra-Tacdol, Edu Ibazeta, Felicia Jacobe, Johnny Nguyen, Sunshine Roque, Patrick Silvestre. November 1, Pay-what-you-can Community Preview Show @ 8pm. November 3, Opening Weekend Reception, catered by local vendors immediately following performance.